The trip was planned. The pilots organised and the aircraft prepared. On Thursday before the weekend we checked the weather. A large high was to remain over the North Island through the weekend. Visibility on Thursday was 40 km with clear skies. Our first leg was Hamilton to Opotiki via overhead Whakatane and around White Island. It quickly became apparent a direct route was not possible because cloud was on the ranges. But we found a gap over the Kaimai Ranges north of the railway line. A clearance through Tauranga Control zone saw us head eastward along the coast toward Whakatane. 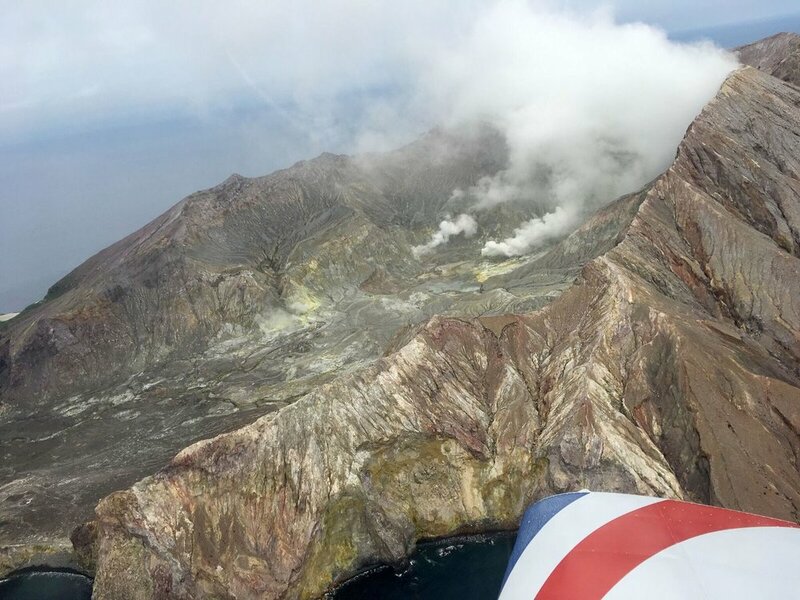 Unfortunately, the weather was inconsistent allowing only some of the aircraft the opportunity to get to White Island. We regrouped at Opotiki for a morning tea stop and a refuel. While we were comparing our flights, we watched a trainee motorised paraglider learning to land. We made our departure east via Te Kaha, Cape Runaway, Te Araroa, East Cape, Ruatoria and finally to Gisborne. There we were met by flying friends, Jacob and Olivia, who marshalled us to our fuel and onward to our parking areas. Lunch was welcome! We had phoned ahead, and the kindly staff kept the café open for us. Jacob told us the vintage steam train had crossed the runway shortly before we landed and if we waited and talked with the controller we might be able to line our aircraft on the runway for a photo shoot as the train crossed the runway on its return. Gisborne airport is the only place in the world where planes give way to trains. Was it possible? Yes, said the controller! So as the train approached, the controller lined us up on the runway with the rail tracks in between the aircraft. As the train approached, the passengers could see us photographing them - just as they were photographing us. Departing south we flew by the site where a slip severs the Gisborne - Napier rail line. The rail line and the sleepers are just hanging in the air some hundred metres above the sea. Little wonder the rail line in its present route is uneconomic to repair. Our route southward took us down the coast to the Mahia Peninsula. The base was well defined with reasonable visibility underneath. We passed the space port at the southern tip of the peninsula. The tracking radars and the launch platform were obvious. A rocket was attached to the launch tower but both were stowed horizontally awaiting launch. A launch will occur before the end of the year. The security guard could be seen in high visibility clothing patrolling the site. We then headed inland to Nuhaka and, once clear of the coastal cloud, climbed to 3500’ to Lake Waikaremoana. This is a truly spectacular lake surrounded by deep bush and spectacular cliffs. We then headed south to the Mohaka River and flew up river surrounded by steep erodible landscapes and sheer cliffs dropping into the river. This was sustained valley flying where terrain and weather awareness training was well practiced. Some took the one of the several opportunities to exit the valley to the lowlands to the east and some flew the entire length of the valley to emerge further south and nearer Hastings. The approach and landing at Hastings was uneventful. The airfield was full of picketed aircraft used in the Eastern Regional aero club competitions that had been held earlier in the day. We managed to find some space and tied the aircraft down. We settled into our accommodation in Hastings and headed to the local tavern and eatery. A wonderful meal and time to share the stories of the day. At one point the local band was drowned out by Tongan rugby league fans who were commiserating their close loss to England. A convey of cars with flags flying and car horns honking totally passed by the tavern. Tongans love their sport no matter what the outcome! We held our briefing early at 0700. Several bleary eyes looked deeply into their coffee cups. Again, the weather was broken cloud at 2000’. Another day of careful flying to transit to the coast and, later, back inland. Our planned trip to Cape Palliser was not possible because of low cloud and fog south of Masterton. So we headed east from Hastings over Te Mata peak and out to the coast. Some went further east to Cape Kidnappers to view the Gannett colony before heading south. We all headed for Porangahau. We had called the farmer to ask whether a landing was possible but he advised that stock were grazing and that the grass was fairly long. A low pass and overshoot would be possible. One by one each aircraft made their approach and overshot before heading over the inland ranges to Dannevirke and on to Whanganui. Heading west, we had to work our way through the harsh the terrain of eastern Wairarapa. We agreed many farms were just eking out an existence. Further west the weather improved with cloud bases at 2000’. Whanganui airport was quiet with only a few aircraft operating. A special thanks to the Whanganui Aeroclub for hosting us. There we had a food and fuel stop and spent some time planning our trip through to New Plymouth. The weather forecasts suggested the Stratford saddle would be closed so a coastal route was preferred. However, as we approached Hawera it was much clearer inland. We crossed the Stratford Saddle at 2000’and headed to New Plymouth. We descended as we approached because, yet again, the weather was broken at 1500’. Another fuel stop, a lunch at Jim’s place, and shared stories filled the early afternoon. Finally, it was time to depart for Hamilton. Some aircraft took the inland route: others took the scenic coastal route. For the first time the sky was clear with a high overcast. The west coast is wild and rugged with little access. It is spectacular with many interesting points along the way: Urenui, Mokau, Awakino, Waikawau Bay, Taharoa ironsands, Kawhia, Aotea and the windfarms; all special in their own way. Route length 700 nm, six landings, 25 turn points, eight aircraft, 20 pilots and passengers, five taxis and many new friends made. Participants, Dion and Teresa, Patrick, Mandy, Euan and Susan, Steven, Tony, Peter, Phil and Helen, Ross, Jake, Evan, Simon, Richard and Moira, Viv, Anatoly and Eddie. Cambridge’s Zac Williams has taken out Waikato Aviation’s Junior Champion title for 2017. 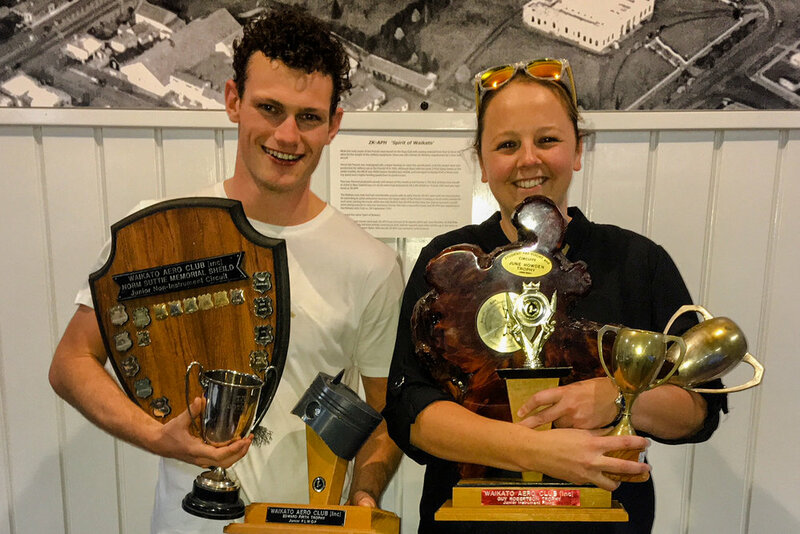 Competing at Waikato Aviation’s Aviators’ Club’s annual flying competition, Williams gained six first places over two days of contests to land the Foote Cup. Designed to replicate actual flying situations, the competition tests pilots' specific skills throughout circuits, landings, flying with, and without, instruments and simulated forced landings without engine power. Circuits require precise landing skills as pilots attempt to land on a target within a grid. Williams grew up in Auckland and would spend weekends watching the planes land at Auckland airport with his grandmother. It sparked his interest in flying. “Humans weren’t made to fly so it’s a massive thrill to be up in the air,” said Williams. Williams is a member of the Vantage Windows and Doors National Sprint Cycling Team and has been flight training part time with Waikato Aviation since 2015. He recently gained his Private Pilot Licence. Williams is currently doing night flying training. Competing in nine seperate flying contests over two days, Jessica Weston is Waikato Aviation’s youngest female, and the first woman in more than twenty years, to become the Aviators’ Club’s senior champion. At 21 years old, and with not quite two years flight training, Weston won the Senior Low Flying, Senior Navigation, Senior Instrument Flying and Ladies Circuits, beating a number of experienced recreational pilots and fellow students, to be awarded the J A Harper trophy. Designed to test pilots' abilities and replicate actual flying situations, the annual competition assesses a range of flying skills. Circuits require precise landing skills as pilots attempt to land on a target within a grid. In the senior instrument flying contest the pilot must rely solely on their instruments. The navigational competition requires contestants to plan, map and fly a predetermined flight without the use of GPS apps, and in the difficult low flying contest the pilot must complete a defined pattern, including steep turns, at the same level and constant speed. Flying is in Weston’s blood. Her grandfather’s brother also trained at Waikato Aviation. Despite Weston dreaming of flying since childhood she joined an accounting firm after leaving Te Awamutu College, but late in 2015 her grandfather came across a Waikato Aviation brochure and gave it to Weston. She took a trial flight and by January 2016 she was enrolled in the full time training course. Weston recently gained her Commercial Pilot Licence and is currently doing night flying and multi engine training with Waikato Aviation. When Weston completes her training she wants to work as a flight instructor, however she hasn’t ruled out a job as a commercial airline pilot with Air New Zealand. In mid November Weston will represent the Waikato at the regional flying competitions in Tauranga. If you have ever thought about flying as a career or a hobby then why not join Mandy, Tracey and Kelly at Waikato Aviation. For Tracey Gore and Mandy de Beer flying was something they had dreamed about since childhood. Tracey took her first flight at eighteen months in a glider piloted by her father and over the years flying with him secured her desire to fly as a career. At sixteen years old she started her flight training in earnest. Mandy also took her first flying lesson at sixteen years old, two months after she arrived in New Zealand from South Africa. Twenty days before her eighteenth birthday Mandy earned her Private Pilot Licence. Kelly Fuatai Lowen’s sisters are both flight attendants – Kelly might have followed in their footsteps but when she saw a picture of a Boeing 747 cockpit she thought it looked so ‘cool’ that her career path was set. Mandy, Tracey and Kelly still love flying and today all three are flight instructors at Waikato Aviation. Mandy is also an aerobatic instructor. A 20-minute flight with Mandy, Tracey or Kelly is a great way to experience the thrill of flight. Flights are available in our two seat Alpha aircraft or in the Cessna four seat aircraft, enabling friends or family to also enjoy the experience. For more information go to www.waikatoaviation.co.nz/experience or ring 07 843 5655. Flying Instructor Kelly Fuatai Lowen has been announced as the first recipient of Waikato Aviation’s new internship programme. “Kelly is the perfect candidate for the role. She has already graduated with our New Zealand Diploma in Aviation (Instructor stream) and with her excellent people and communication skills we believe she has a great future in Flight Instruction,” said Waikato Aviation General Manager and Chief Flying Instructor Peter Wilson. Lowen, a local girl who finished her schooling at Waikato Diocesan school, joined Waikato Aviation’s Diploma in Aviation course in 2015. Training pilots since 1933, Waikato Aviation has seen a considerable increase in the demand for Flight Instructors. The Civil Aviation Authority requires all Flying Instructors to have completed an initial six months and 100 hours of instructing under the direct supervision of a senior Flight Instructor. Waikato Aviation’s internship programme will provide this initial experience. “An experienced senior Instructor will mentor and support each intern, helping them to develop their instructional skills both in the classroom and in the aircraft”, said Wilson. Interns will be selected each term from Waikato Aviation graduates, with the next intern being announced in October. A change of name, a rebranding exercise and a new aircraft has marked Waikato Aviation’s further investment in the aviation education business. Formally known as Waikato Aero Club, Waikato Aviation have been training pilots for more than 80 years. General Manager and Chief Flying Instructor Peter Wilson said “The new name better represents the company’s unique blend of recreational pilot training, full time professional pilot courses and commercial aviation services. Many members of the Greater Waikato community have gained a pilot licence with us and we have a 90% success rate for our course graduates finding employment within the aviation industry”. In keeping with their planned investment in the aviation industry, Waikato Aviation has recently purchased a twin engine DA42 aircraft. The DA42’s state of the art instrumentation and navigational systems are similar to those used in commercial airliners and better equip students for a commercial pilot’s role. Waikato Aviation offers the two year, full time course, the NZ Diploma in Aviation. Students graduate with a Commercial Pilot Licence. The next intake is in September. "Employment pathways to the future"
Waikato Aviation’s internship programme is designed to prepare graduates of the New Zealand Diploma in Aviation Instructor Stream with on job training in a mentored environment. Interns are directly supervised by a senior instructor. The senior instructor will mentor and support the intern helping them to develop their instructional skills both in the classroom and in the aircraft. The internship programme will give the graduate 6 months direct supervision. This will enable the intern to be better positioned and work ready when applying for employment on completion of the programme. The programme will include all components of Flight instruction; delivering pre-flight briefs, flying lessons, post-flight debriefs, teaching in the classroom, aircraft cleaning and maintenance, administration work and other tasks related to the operation of a successful aviation organisation. Key outcomes of the internship will be; Customer service focus, the ability to work in a team environment, time management, to interact with peoples from the flight academy and community, to interact with peoples from all cultures and backgrounds. The programme will be 6 months in length during which the intern will be paid for time worked in the classroom and in the aircraft. To be successful in gaining a place on the internship programme, graduates will have demonstrated an above average standard during their training programme. Graduates need to apply and meet certain criteria based on performance and suitability. My whole life leading up to that point was playing outside, running around with the dog, attending school and not knowing what I was going to do with my life… I was young, does anyone know what they want to do with the rest of their lives at the age of 12? Well… that air show… did that leave an impression!! We get to see it often, its always the same. The smile after that first flight is priceless. Giving someone the experience of flight is so much more than just a day out. Firstly its the excitement of something new, an experience that can’t be had everyday. Then there’s the buzz of taking off, climbing in to the unknown, looking down and realising that the world really is beneath your feet, anything is possible. As a child, I wanted to fly. It’s all I ever wanted to do. I wasn't one of those kids who was inspired by a magical aviation experience and I didn't know any pilots with exciting stories but I did have the dream.